In May 2017, Uniondale, a small suburb of New York City, will host the final chapter of nearly 150 years of animal exploitation and cruelty — the last performance of Ringling Bros. Barnum & Bailey Circus. When it announced in 2015 it was phasing out elephants in its performances, Ringling Bros. cited "a mood shift among our consumers." It also cited the difficulty of fighting local legislation that would affect its shows, ranging from outright circus bans to the prohibition of the notorious bullhook, a sharp hooked tool commonly inserted in elephants' skin to train and corral them. This time, on its outright closure, the company pointed to high costs and declining ticket sales. Declining ticket sales are no doubt due, in large part, to an increasingly sensitized public staying away from the shows in droves. Only the Shrine Circus continues as regular fixture in Ottawa. 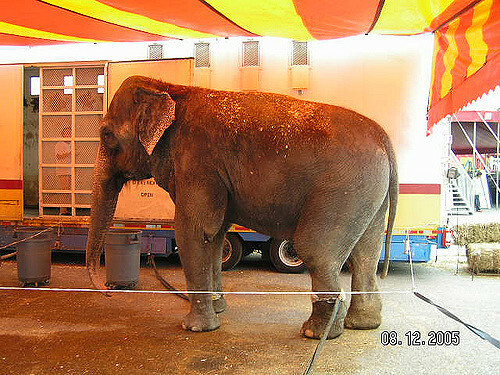 The OHS has been long opposed to captive wild animals in entertainment. In 2002, the OHS lobbied city council to ban elephants and other captive wild animals in circuses and other entertainment, as do many jurisdictions, including whole countries such as Austria, Greece, the Netherlands and Mexico. The city instead instituted a licensing regime. The OHS responded that the city should not license animal cruelty. Today, only the annual Shrine Circus continues as regular fixture in Ottawa. There is no legislation on the horizon. But in the end, money talks. It spoke to Ringling Bros. And you can make your money talk by not supporting the Shrine or any circus.